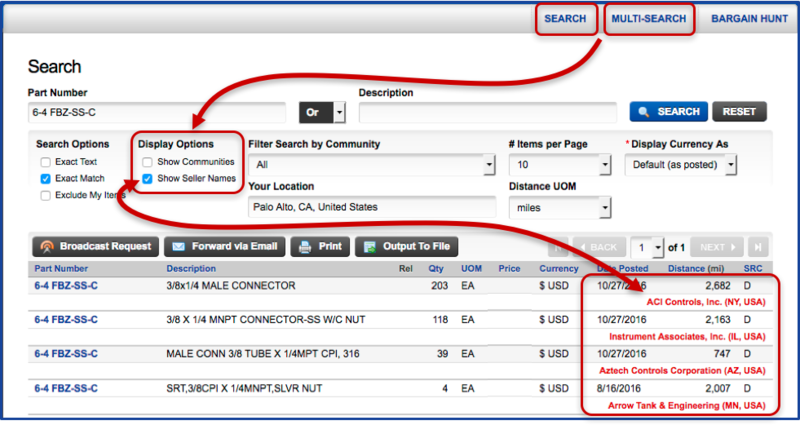 Either before or after performing a SEARCH or MULTI-SEARCH, check the box labeled, “Show Seller Names”. Then leave that box checked. As long as your browser accepts cookies, this box will remain checked when you revisit the WarehouseTWO website. And the name of the seller will appear on the right side of the screen for every search. As an example, consider a search for an item whose base model code is “930” and the desired option code is “FSFF”. None of the other characters in the part number matter. The screenshot below shows the results for such a search. WarehouseTWO offers “unauthorized” access to nearly any inventory-sharing community at its website. This is “POST-only” access, in that a member may post its inventory data to the community for authorized distributors to view it, but the member with “unauthorized” access cannot see any other inventory posted to the community, other than its own postings. This functionality allows a member to expose selected unwanted inventory to an ideal target audience (“authorized” distributors of these products), without disrupting the manufacturer’s sales channel. Got inventory from manufactures that you do not, or no longer, represent? Offer it for sale at WarehouseTWO. Communities for which “unauthorized” access is NOT permitted are identified by the “null sign” (“∅”) appearing at the end of the community name, as displayed at the WarehouseTWO website.